Featherstone Lions under nines performed excellently in the Rhinos Challenge at the Skegness festival. Picture: Lauren Twigg Photography. CHARLIE Sharp scored three tries as Featherstone Lions under nines gave another impressive display at Oulton Raiders. Lions were the slightly better team when the sides met at the Rhinos Challenge at the Skegness junior RL festival the previous week. The return match proved just as competitive. Both teams tackled magnificently in the early stages. 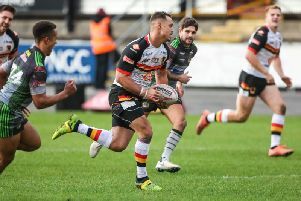 Featherstone’s prolific try scorer Zack Clegg was the first to threaten with a strong charge downfield, only to be held just short of the line. Speedy winger Max Hobson then looked a certain scorer when he raced 40 yards but he was also foiled by Oulton’s scrambling defence. Both players, however, went on to demonstrate their lethal finishing with two tries apiece. Hobson earned the most improved player award. Oulton scored first but Lions soon hit back and showed great spirit and skill to take control. Scrum-half Freddie Frankland was a constant threat. His excellent work from acting half provided numerous chances for the strong running Sharp who again showed his ability in attack and defence. Lions MOM Sharp’s third try was created by direct running and an excellent off-load from Riley Barker. Barker’s fellow prop Kane Stirling complemented the work of Riley with several powerful runs into the heart of the Raiders’ defence. Hard working pair Alfie Bailey and Jensen Connolly tackled tirelessly throughout. Harry Parker again showed again how difficult he is to stop when running onto the ball and Mason Dyas ran strongly and defended superbly to deservedly take the top tackler award. Blake Allen improves every week and he again impressed with his support play and defence. Tough tackler Logan Thomas seems to have recovered well from a recent injury and produced another solid performance. Stand-off Jack Twigg demonstrated his ability to run at the defence and distribute the ball intelligently. Twigg won the opposition coach’s man of the match accolade. Harley Telford, who has made outstanding progress in his first season, deservedly won the sponsors man of the match award for a courageous show in attack and defence in a tough encounter. Oulton played their part in a cracking game and seriously tested the resolve of the Featherstone side. Lions now have a break this weekend before preparing for, potentially, their toughest test of the season when derby rivals Normanton Knights visit the Mill Pond Stadium on Wakefield Road, Featherstone, on Sunday, June 4.